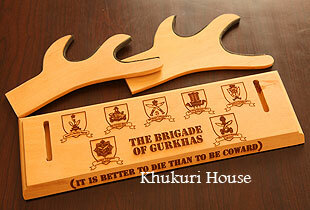 Gurkha items are things that are associated with the Brigade of Gurkhas. These accessories are the Gurkha Hat which is a must for a Gurkha to complete his uniform, Gurkha Regimental Plaques and Regimental cap badges frame of the Brigade of Gurkhas for collectors. Tiepin or brooch made from silver are very good souviners and are often seen worn by gurkha officers on their ties or on their uniforms.